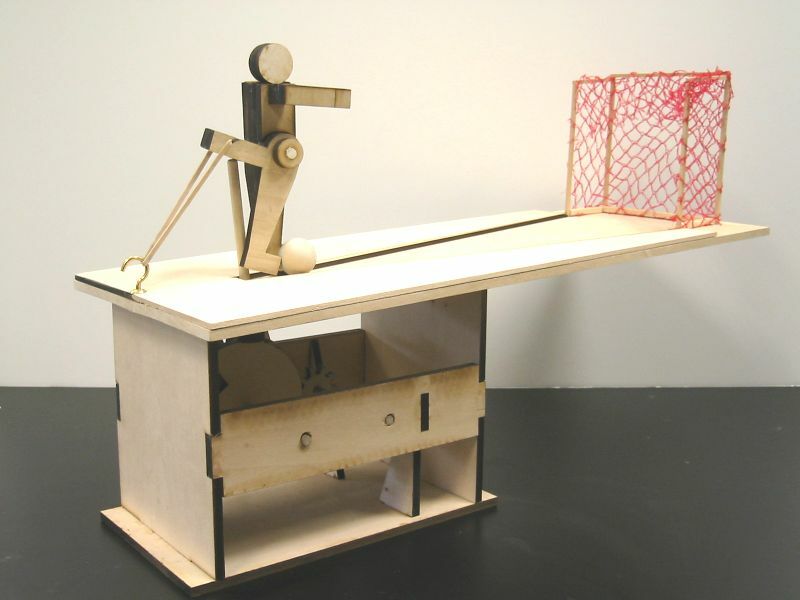 This page presents a selection of automata and mechanisms that have been built with MachineShop. While some have been built by adults, the samples created by the test users make up the majority of these examples. 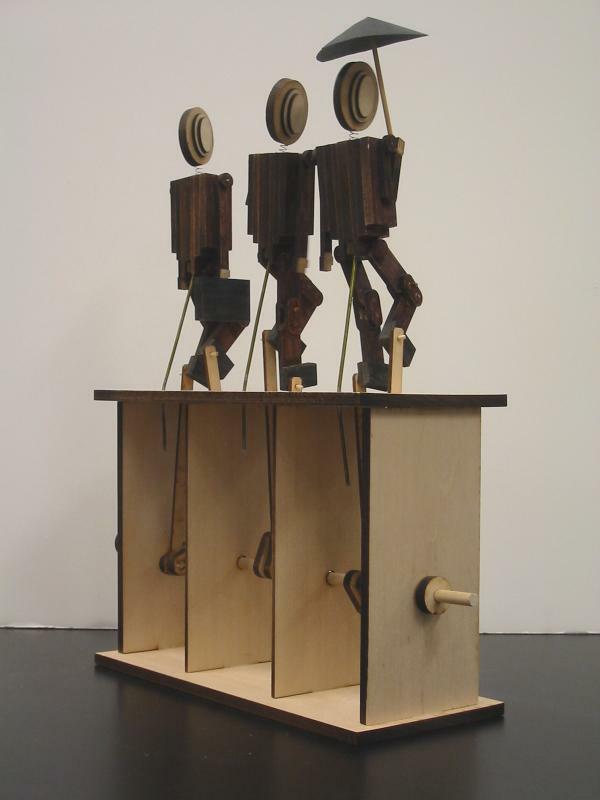 At the time that they were working with MachineShop on these automata the test users ranged in age from 10 to 12 years. Please click on the thumbnail images to get larger pictures and on the movie links to see these in action (Quicktime 7.0 or higher required). 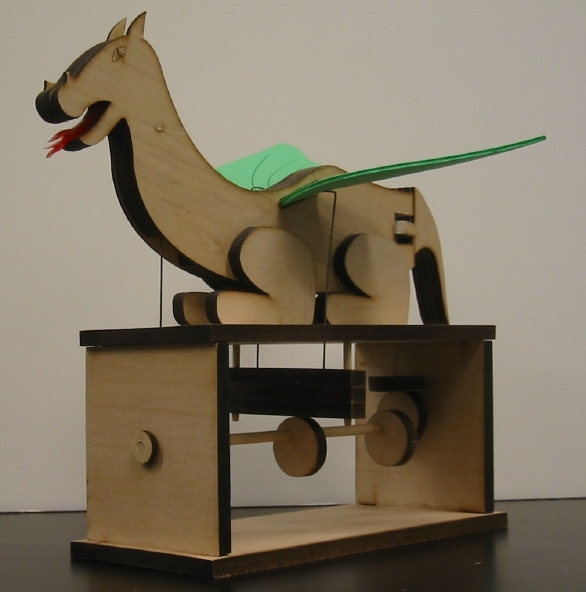 This was the first automaton built by Dylan, the first test user. It was inspired by a mountain lion sighting that occurred during an overnight school camping trip. During night hikes, one of the groups came upon a mountain lion who fled in the face of superior numbers, but that event was the spark for this automaton. 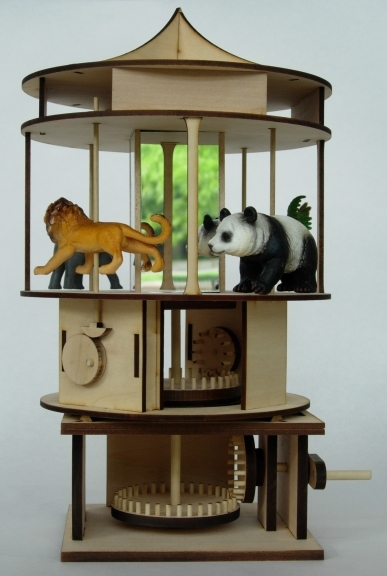 The mechanism uses a ratchet both to limit motion such that the lion only can leap forward and with an offset pin to create a crank slider (the first time I had seen this combination). 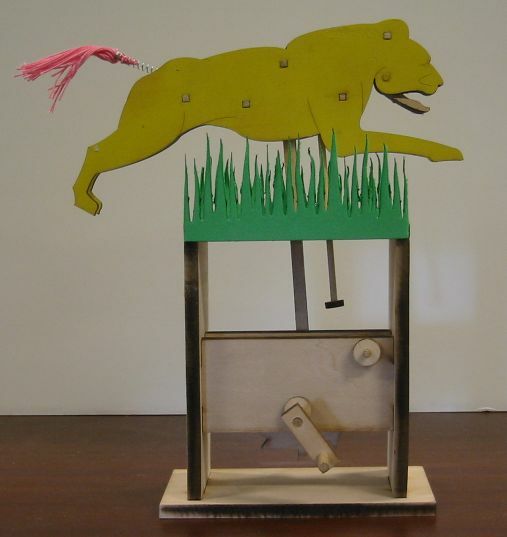 To make the lion's jaw open and close as it leaped, the jaw became a lever of the first order operated by a rod that contacts the base at the extreme upper and lower points of the lion's motion. Note that the pink tail was just for testing purposes and has since been replaced. 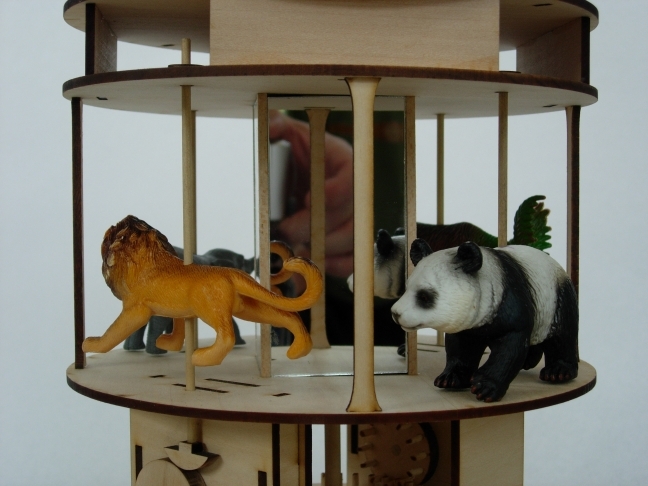 The lion, mechanism, and framework are all laser cut from basswood. The decorative grass is cut from craft foam with the laser. Wooden dowels, the spring from a ball point pen and some pink string round out the bill of materials. 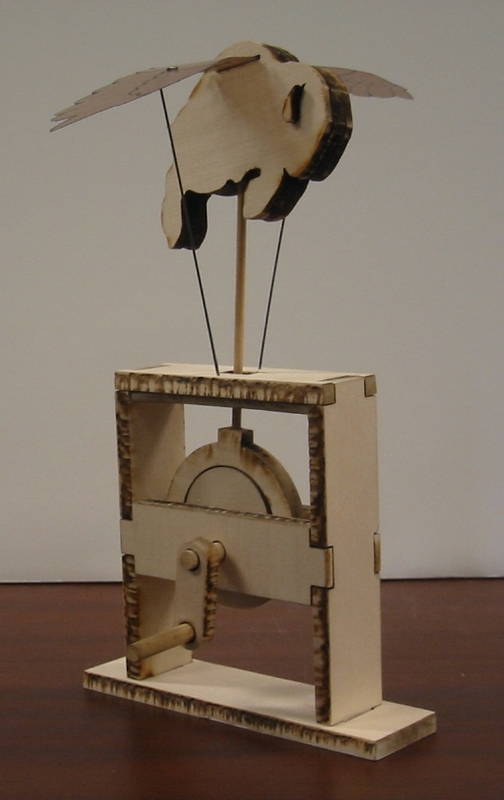 The lion's jaw is a lever of the first order and opens and closes as the stops on the rod contact the upper member in the mechanism framework. On the finished lion, all of this motion with the exception of the jaw itself is hidden from the viewer. These photos and movies show a copy of the original in which one side of the body has been replaced with a duplicate made from clear acrylic plastic. 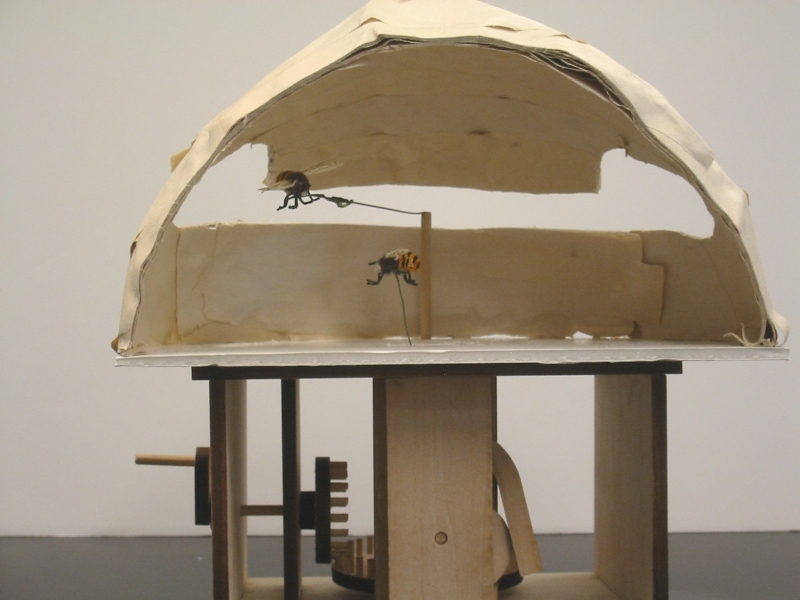 This beehive is Dylan's second automaton and the idea for it came from watching bees as they became active in the Spring. 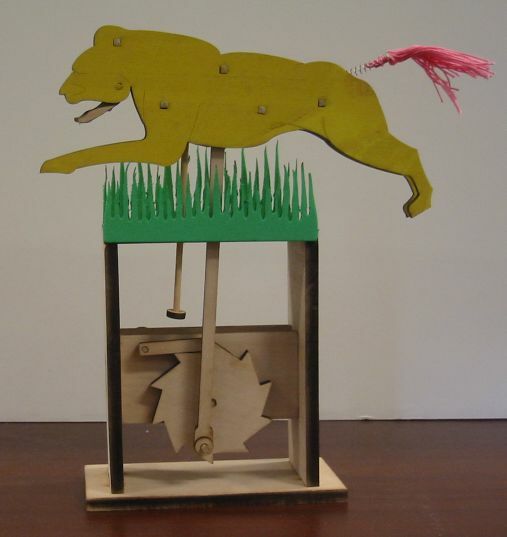 The mechanism for this automaton is quite different from that in the Leaping Lion and consists of components for two synchronized actions. 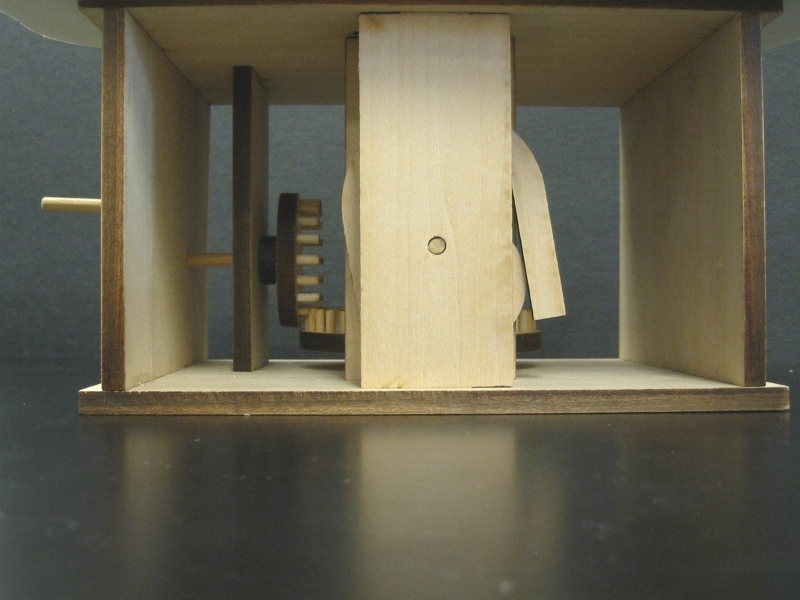 Initial input comes from a pinwheel gear attached to the crank. 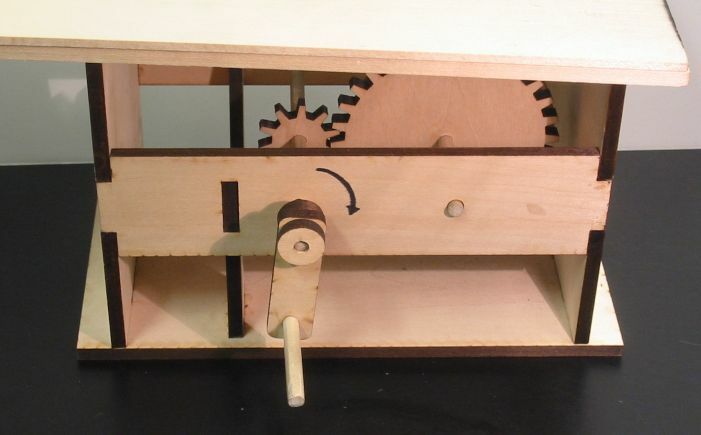 The motion of this gear is transferred to the larger pinwheel gear at the bottom of the mechanism. Because of their relative sizes the input gear rotates twice for each rotation of the larger gear. The shaft to which the large gear is attached rotates the flying bee as it moves into and out of the beehive. 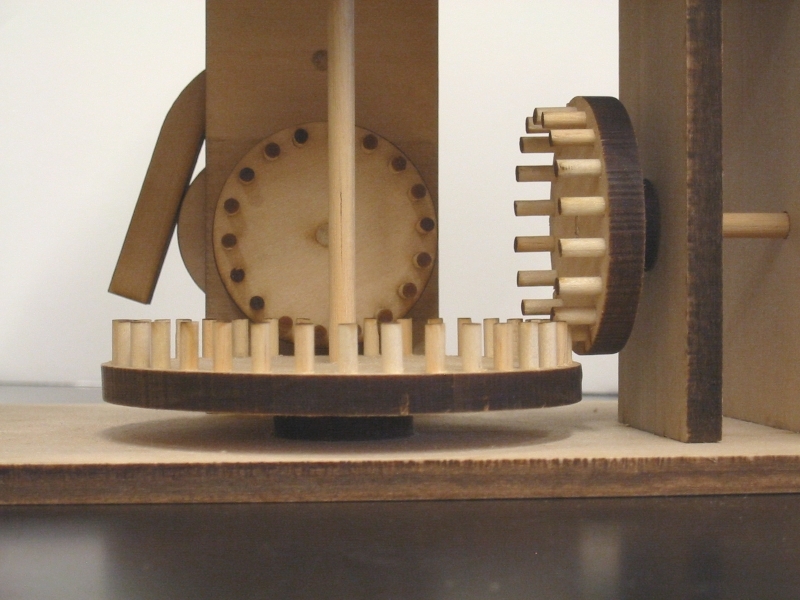 A second smaller pinwheel gear is moved by the rotation of the large gear and transfers its motion to an eccentric cam located at the front of the mechanism. The cam moves a yoke shaped follower which moves back and forth causing the attached bee to do the same. 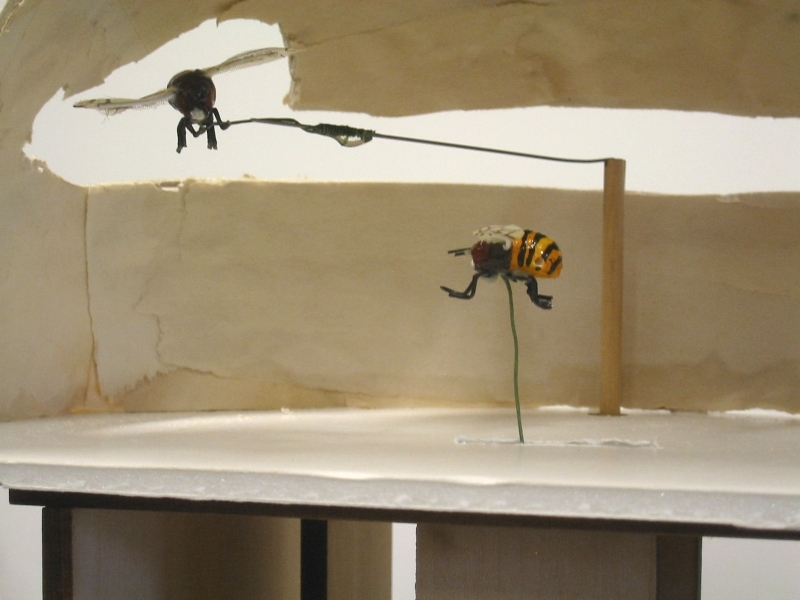 Because of the 2:1 ratio of the input to large gear and the 1:2 ratio of the large to cam gear, the bee which moves back and forth completes two complete actions while the flying bee completes only one loop through the hive. All of the wooden parts with the exception of the shafts were cut on the laser cutter. 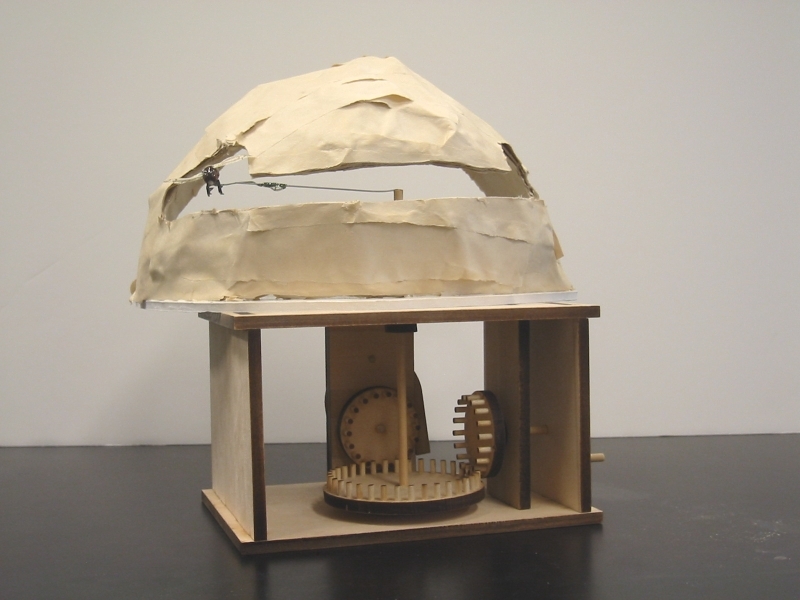 The beehive is papier maché and the bottom of the beehive is made from foam core board. The bees are craft items used by flower arrangers. 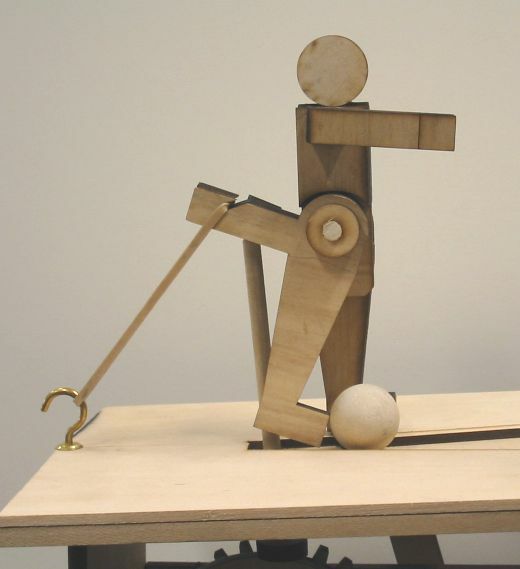 This soccer player automaton was built by Sam. The idea came as he was at soccer practice one night after he and I had met the first time to discuss the research project. 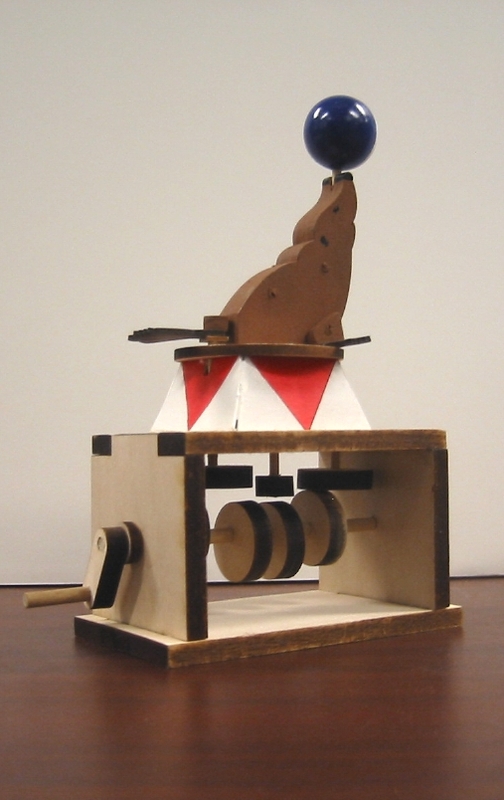 The automaton changed somewhat from the initial design which had the player stationary while the mechanism moved the ball from the player's foot to the goal and back again. 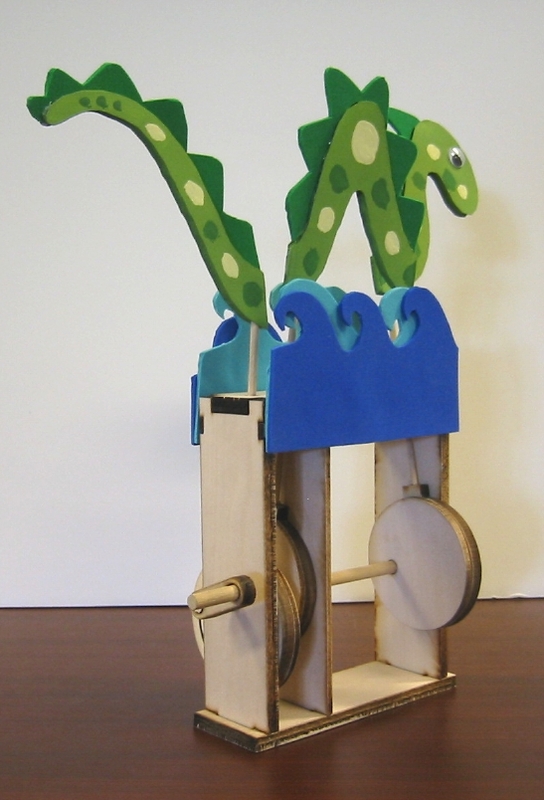 The mechanism uses a single lobed snail cam to push the kicking leg back and a rubber band to pull the leg forward. 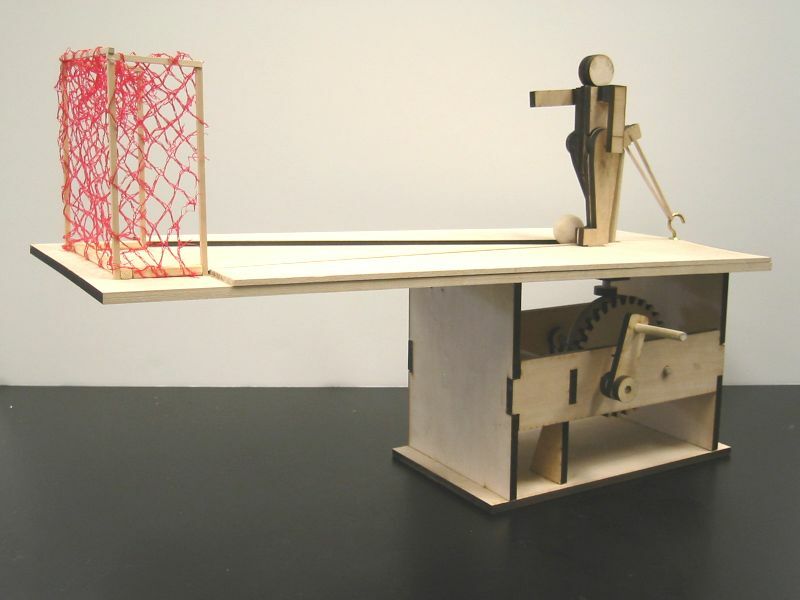 To allow the user to continue to turn the crank while the ball travels to the net and back to the foot, a set of 3:1 spur gears is used to reduce the speed at which the leg is pushed backwards. This has the added benefit of making the mechanism easier to crank. 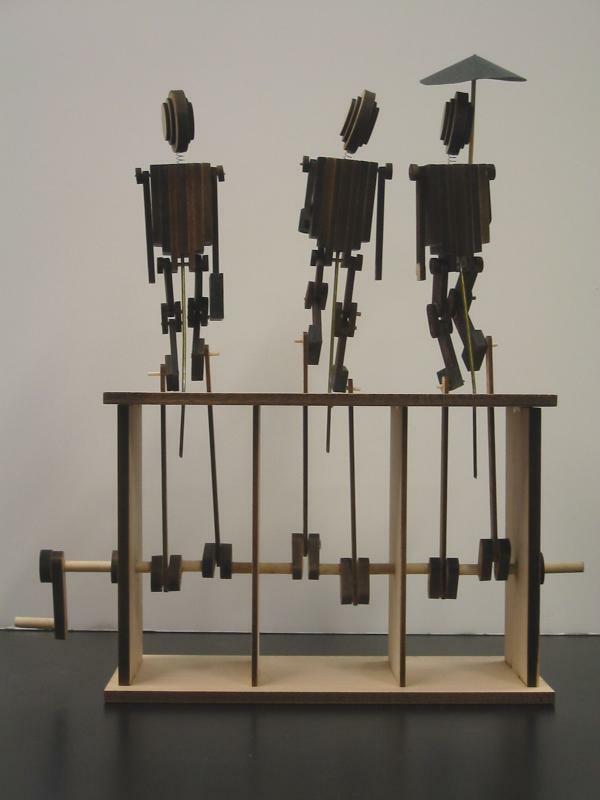 The framework and mechanism were laser cut from basswood and wooden dowels were used for the shafts, handle, and the follower rods. The player's body is also cut from 1/4 inch basswood. The ball is a 1" diameter wooden ball purchased at a craft store. The net for the goal is from a bag of onions. A cup hook is screwed into the playing surface to anchor the rubber band. 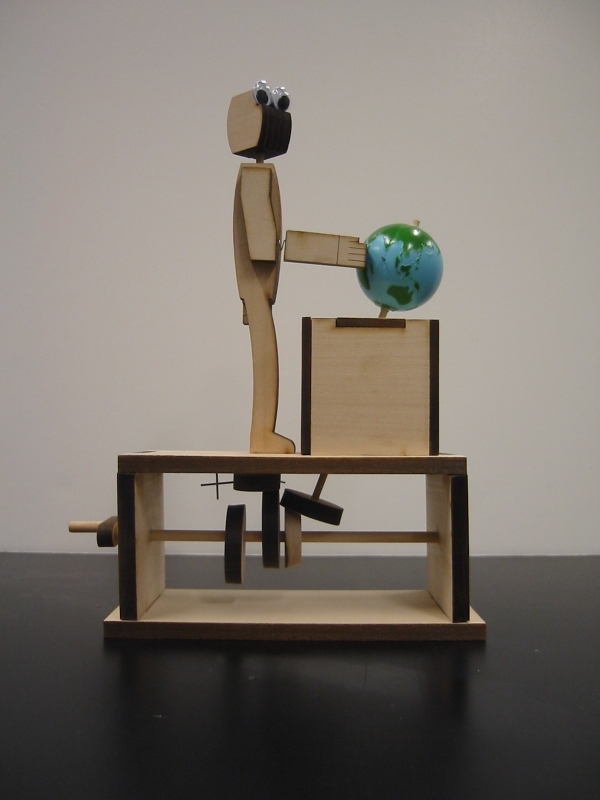 This second automaton built by Sam is much more elaborate than the soccer player. Proposed at the end of the soccer player build, the look and the mechanism were well formed from the outset with no input from me. Along the way some changes occurred in the design of the mechanism. These were mostly minor and included moving the portion of the mechanism that moves the animals up and down from above the animals to below them. This simplification of the mechanism came about over a period of weeks as alternate approaches were examined and discarded. 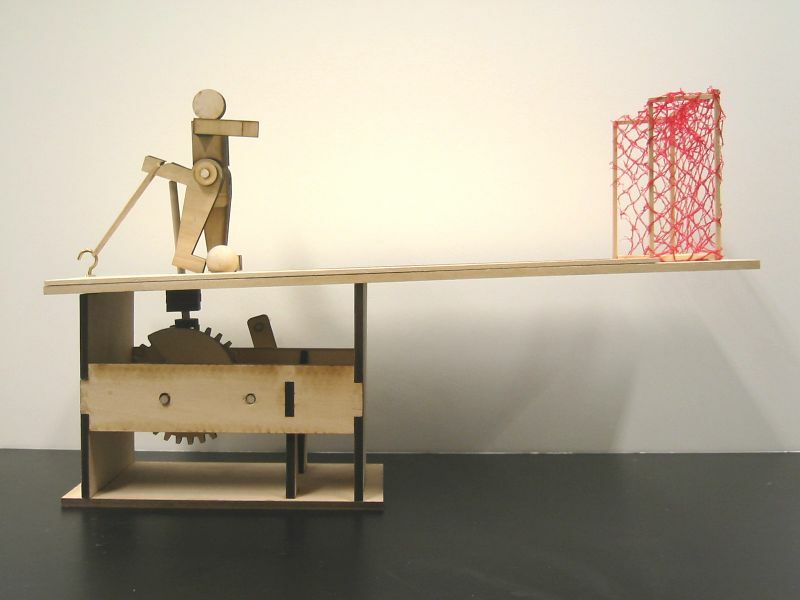 The mechanism is composed of two distinct machines working in concert. 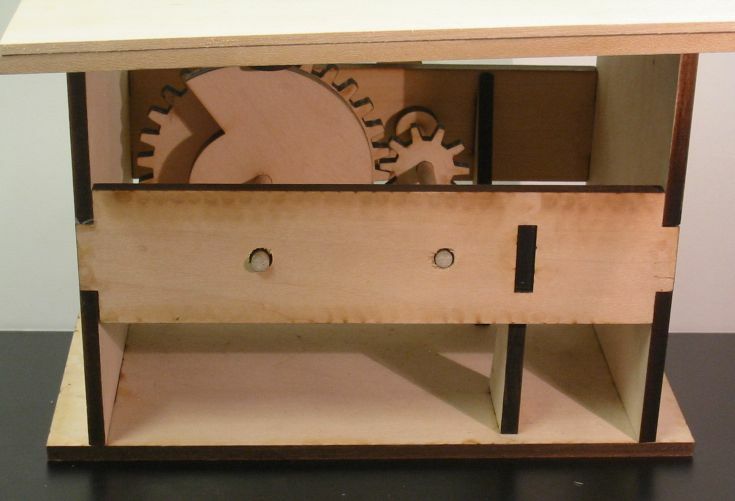 In the base, a pair of pinwheel gears with a 2:1 ratio transfer the horizontal rotation of the crank into vertical rotation of the central shaft at a reduced speed. This shaft turns the carousel proper to which are affixed the supports for the upper mechanism. 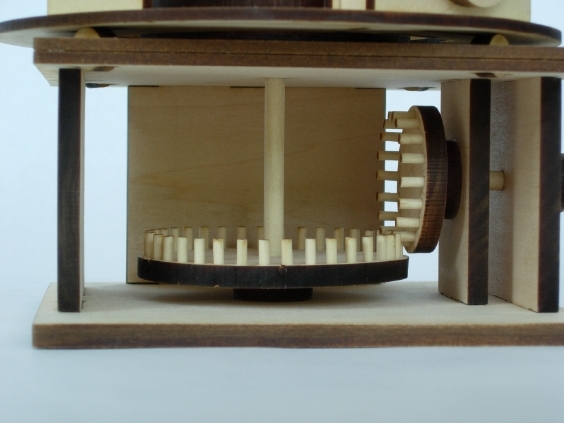 Pillow blocks attached to the floor of the carousel support two pinwheel gears, each with an attached eccentric cam. 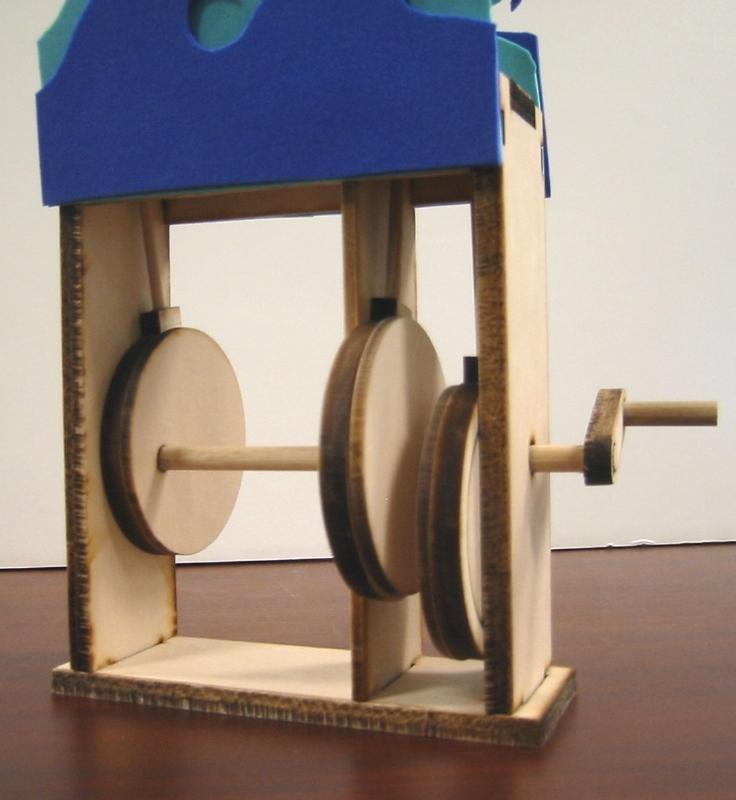 These pinwheel gears mate with a larger pinwheel gear fixed solidly to the top of the base. Because this gear is stationary, the rotation of the carousel causes the smaller gears to rotate as they are moved with the carousel. The motion of the cams imparts the up and down motion of the moose and lion. 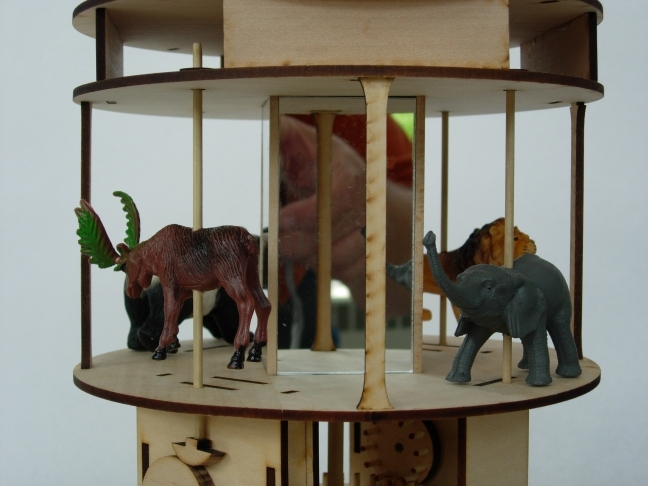 All of the pieces, with the exception of some of the dowels used for shafts and the animals, were cut on the laser cutter. 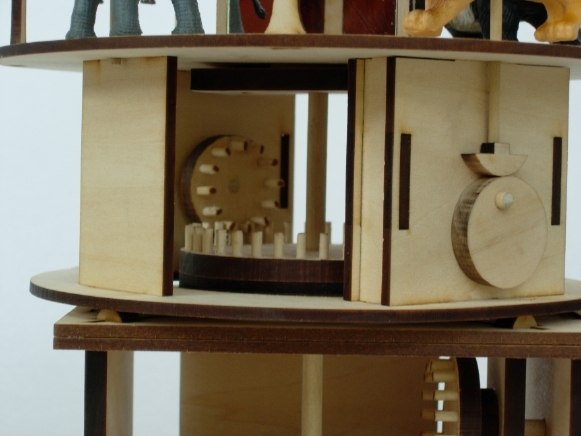 This includes the four pieces of acrylic mirror at the center of the carousel itself. The wooden pieces are cut from basswood sheet. 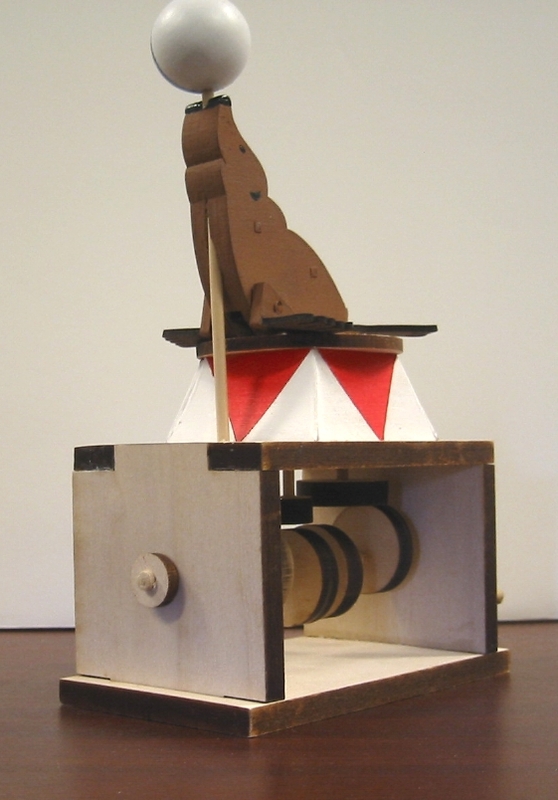 Calum built this automaton to better understand the movements that make up human walking. The three commuters set out from home for the office. Each carries something important for his day: a briefcase, a coffee cup, an umbrella. And each plods along like an automaton. 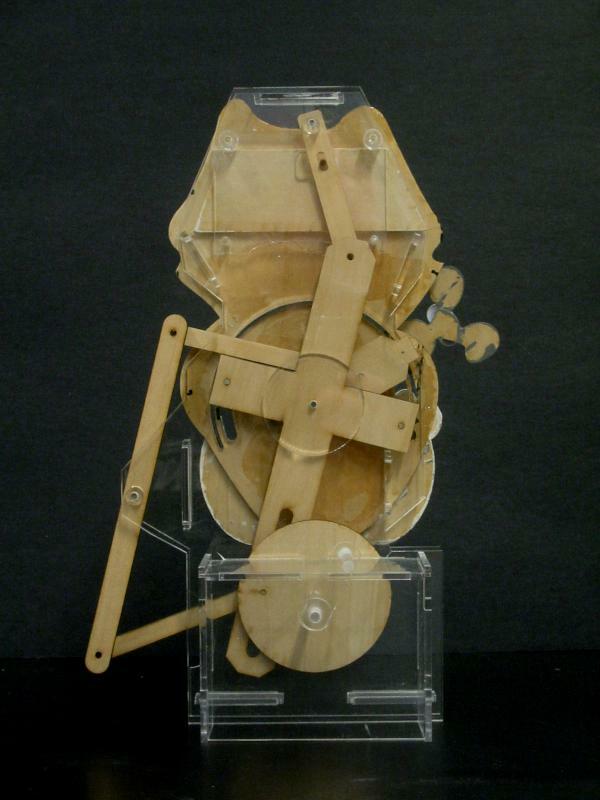 The mechanism for this automaton is very straightforward, but being multiplied by three makes it fascinating to watch. Two cranks offset by 180 degrees move followers attached to each ankle. The motion of these crank sliders moves the feet through an elliptical path which is transferred to the legs. The legs are free to move at the hip and knees. 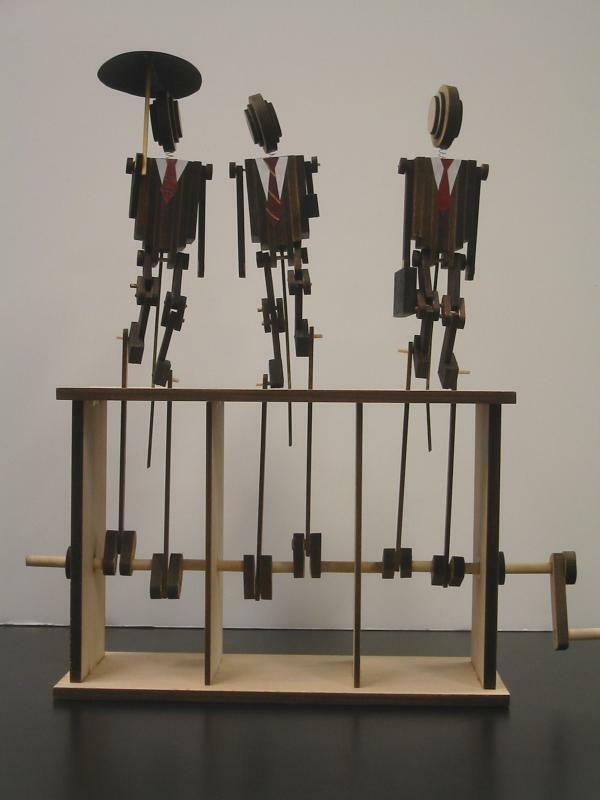 Some of the motion from the cranks applies a bit of twist to the bodies of the men which, in turn, causes the arms to swing and heads to move on their spring necks. With the exception of the support wires, dowels, umbrella, cup, shirt and tie cutouts (from magazines), and ball point pen spring necks, all pieces were cut on the laser cutter. 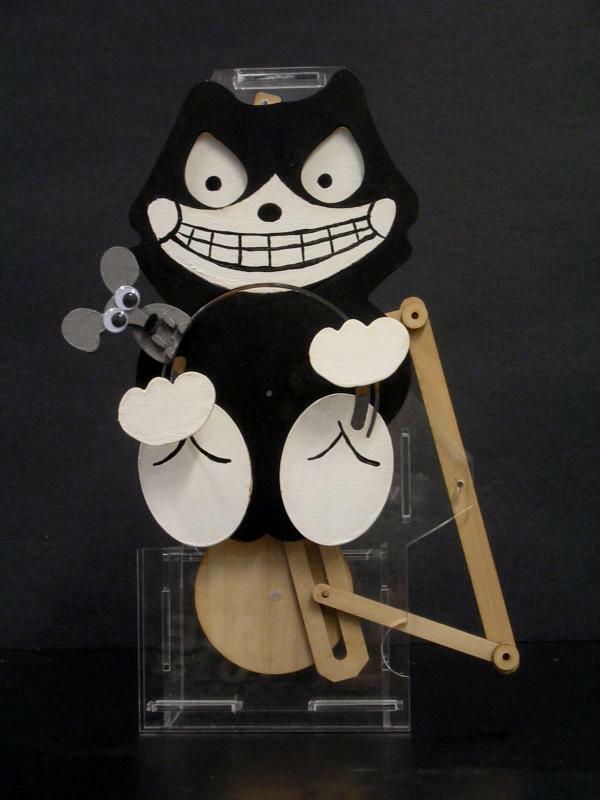 The Evil Juggling Cat was built by Frank who was inspired by the look, if not the personality, of Felix the Cat. Being a cat owner, this user had seen cats play with mice and took that behavior to its logical conclusion. 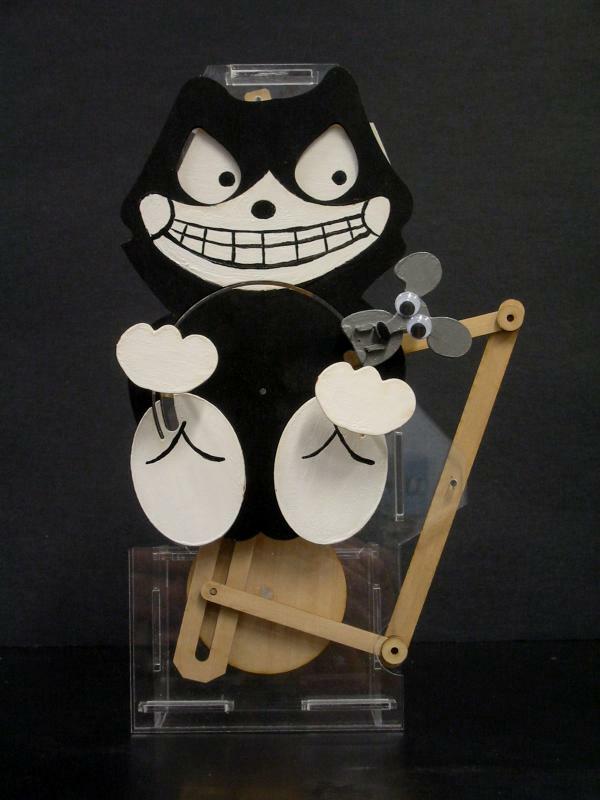 This automaton uses a very complex mechanism which has a series of levers connected together into linkages to produce the motion of the cat juggling the hapless mouse. Each of the three motions (mouse, paws, and eyes) is coordinated by driving them off the same offset pin disc. 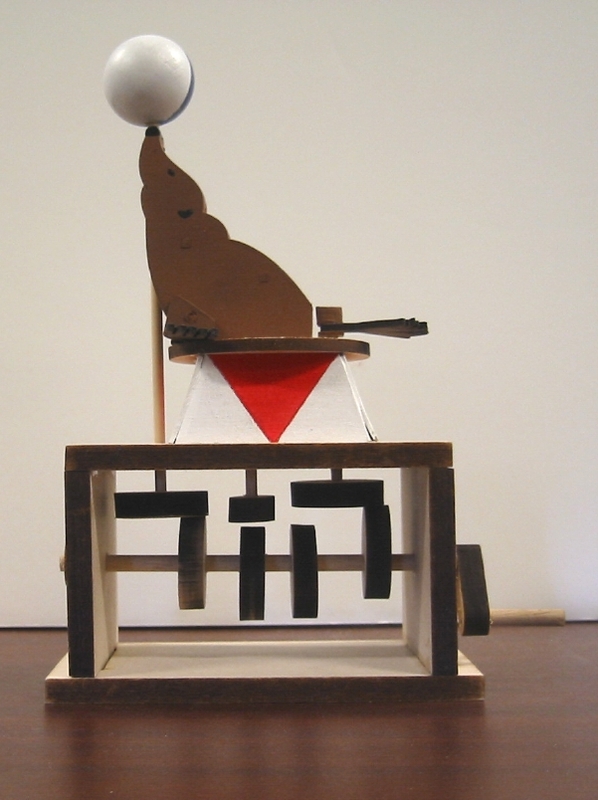 The mouse is moved through an arc by the three bar linkage visible to the cat's left side. The paws are attached to a crossbar on the main lever that drives the lever to which the eyes are attached. 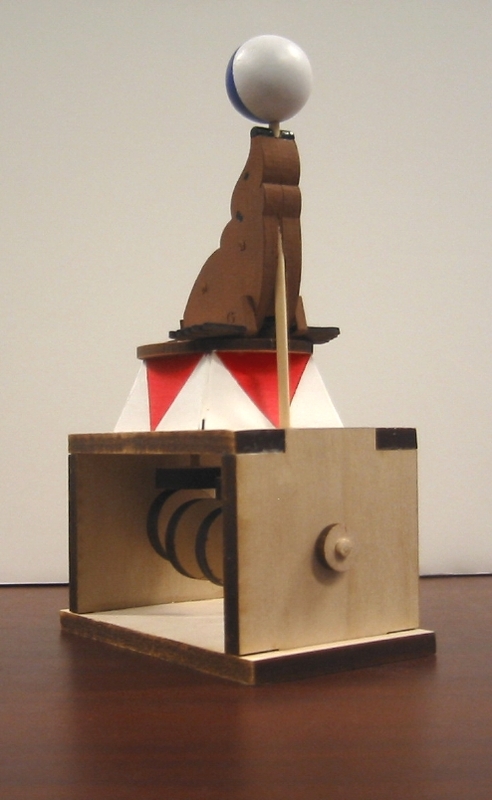 This mechanism makes use of levers of both the first and second order and coordinating the final movemements became the most challenging part of the design. 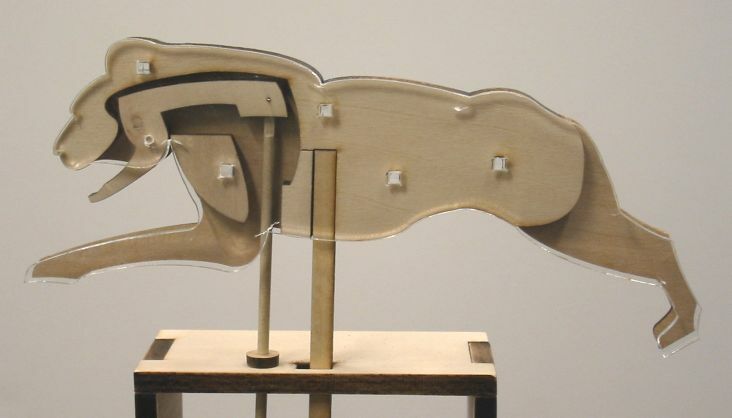 The structural framework for the cat is cut from clear acrylic plastic so that the viewer can see the workings of the mechanism. The acrylic pieces along with the cat, mouse, and mechanical components were cut with the laser cutter. The cat and mouse were drawn by the user and transferred to files for cutting by the researcher. Frank painted them with acrylic paints prior to final assembly. 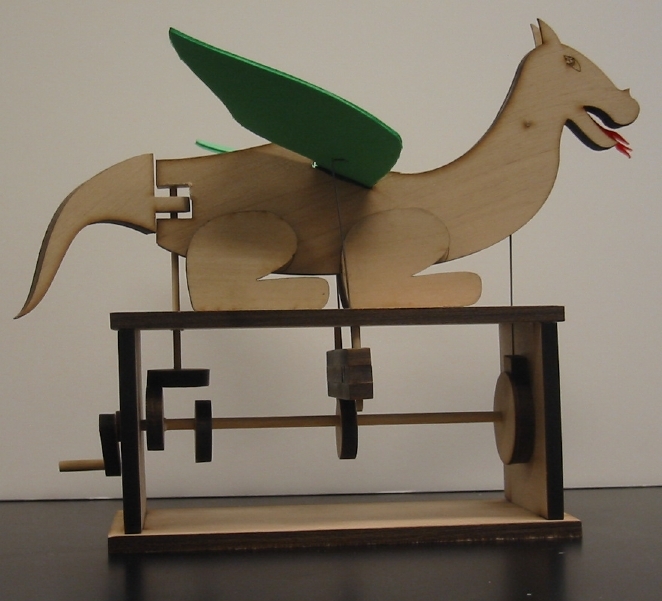 This automaton was built by Abbie who's favorite animal is the dragon. Originally conceived as a bit more threatening (it does breathe fire after all) it evolved into this more gentle beast. 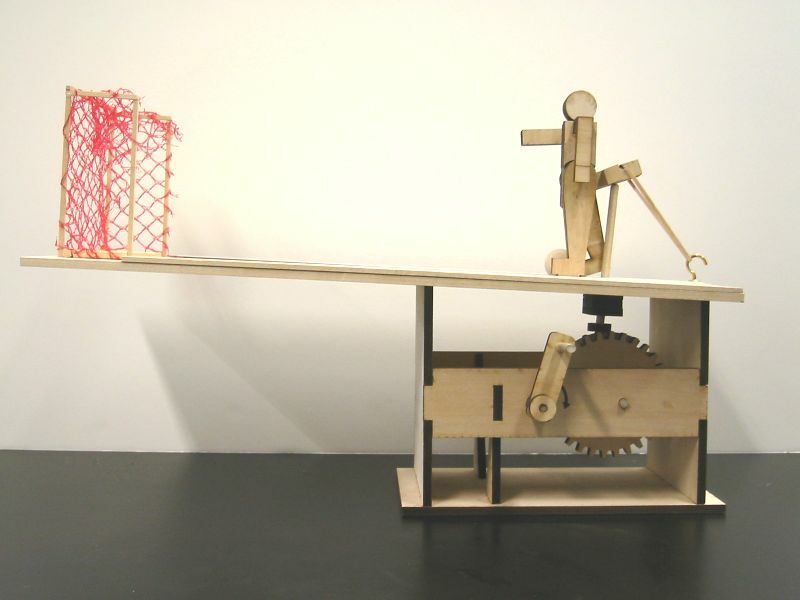 The mechanism consists of a collection of eccentric cams and followers and levers. At the dragon's head a ring follower transmits that cam's motion via a wire to the first order lever which moves the acrylic flame in and out of the mouth. The wings are third order levers which are raised and lowered by wires conncected to the large block follower on the middle cam. Because the wings are constructed of craft foam they have very little weight and a larger follower than would normally be needed is required to help lower them when the cam is turned. At the tail two eccentric cams are offset 180 degrees from each other and positioned on opposite sides of the disk follower for the tail. 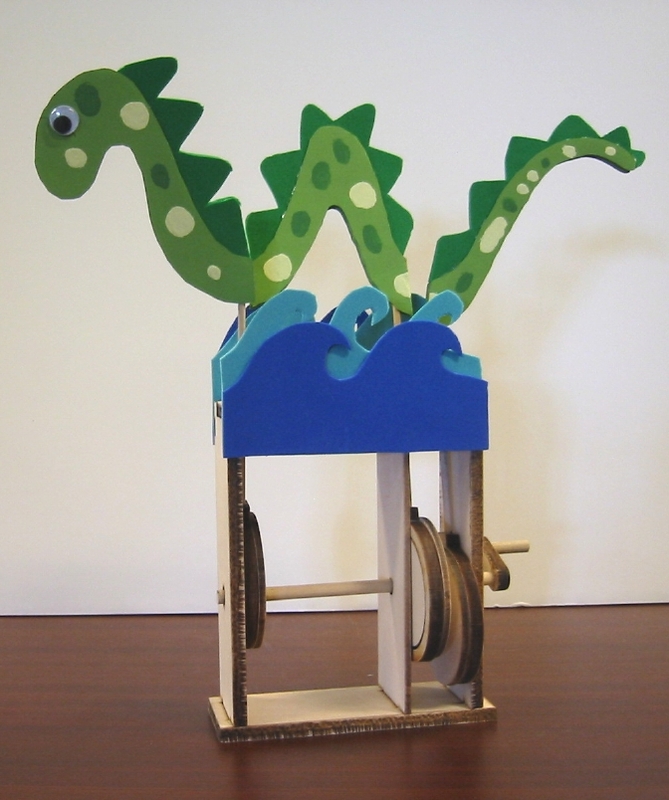 This causes the tail to move from side to side as the crank is turned. The wooden pieces (with the exception of the dowels), the wings, and the acrylic flame were all cut with the laser cutter. Abbie had originally intended to paint the dragon but has since decided that it looks fine just the way it is. 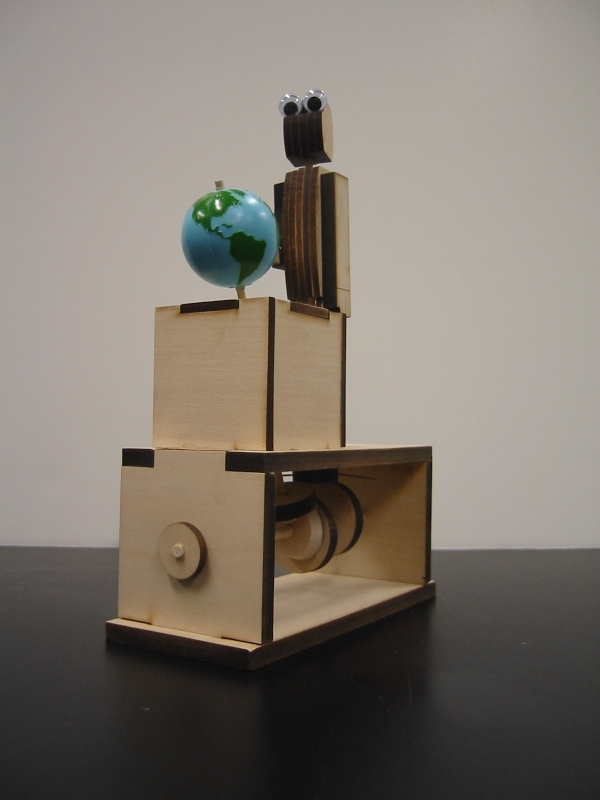 This automaton was built by Iris who got the idea watching a friend spin a globe in the library. 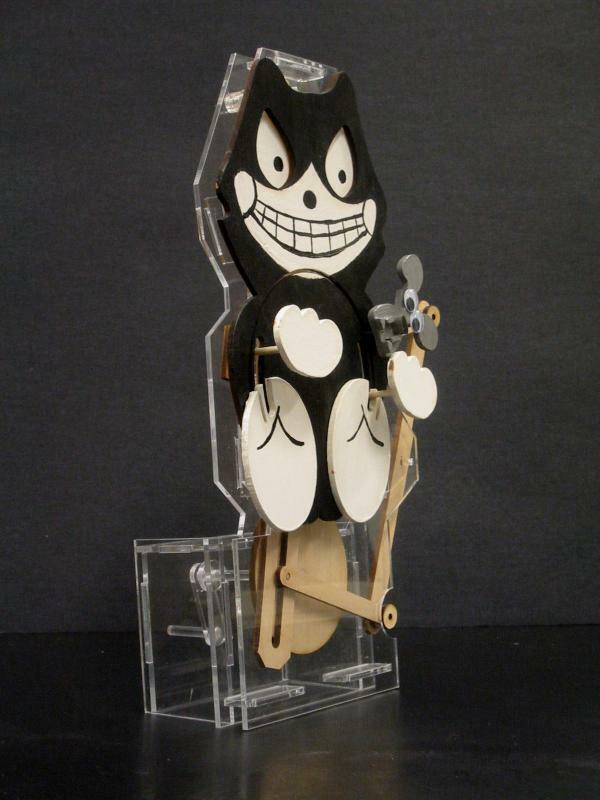 There are three motions in this automaton, only two of which come directly from turning the crank. The rotation of the globe comes from the contact between the disk on the globe shaft and the tapered disk on the input shaft. 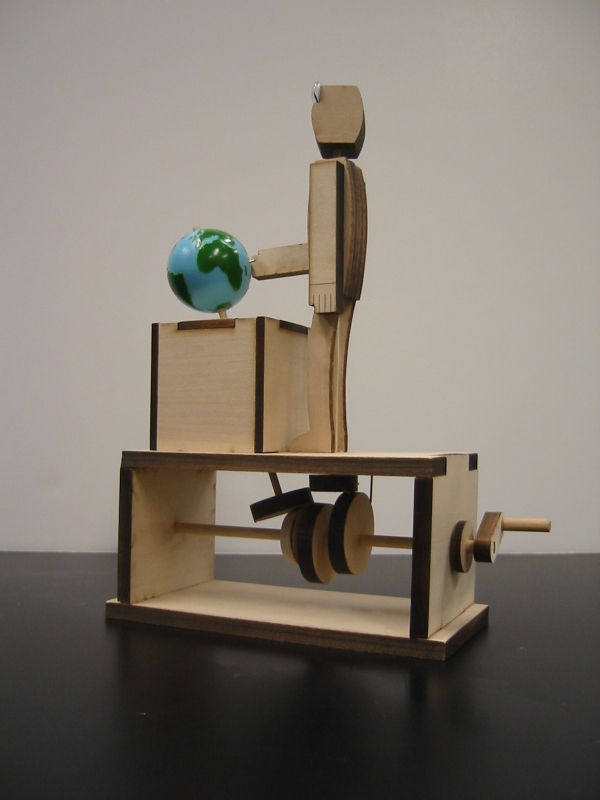 Because the user wanted the globe to lean at an angle (as a real one would) one of the disks was tapered by placing it in a drill press and using a file to create the taper. The oscillation of the man's head comes from the action of the two opposing eccentric cams on the disk attached to the head's shaft. Because these cams are oriented 180 degrees from each other and are on opposite sides of the head's shaft, each turns the head in the opposite direction of the other. Small wires constrain the amount the head can move in either direction. The motion of the hand is caused by a wire inserted into the globe which strikes the hand as the globe turns. Because the forearm is attached to the upper arm via a small spring, the hand and arm move each time the wire comes around. With the expection of the dowels, all of the wooden pieces were cut with the laser cutter. The globe came from a toy store and the goo-goo eyes from a craft store. The spring in the arm is from a ball point pen. Designed by Tom Wrensch while a PhD student at CU. 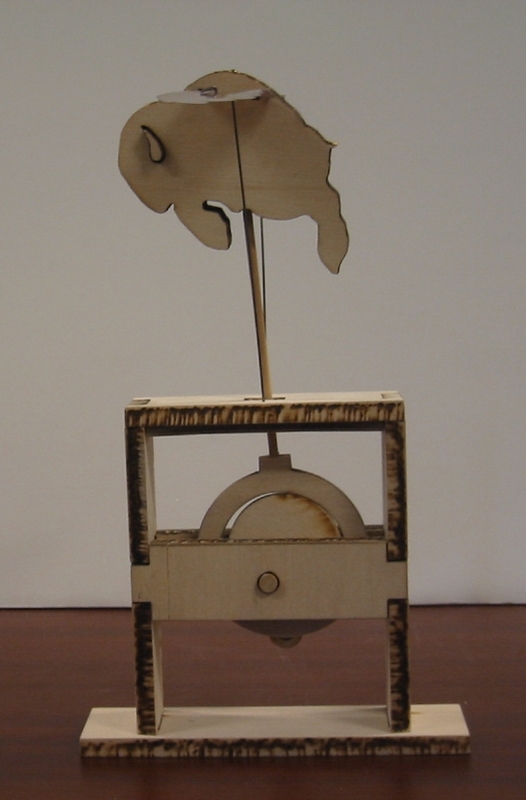 Ralphie is the official CU mascot and Tom patterned this automaton on Pigs Might Fly by Keith Newstead. 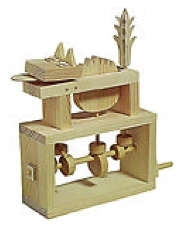 This was the very first automaton produced with the nascent software that presaged MachineShop. 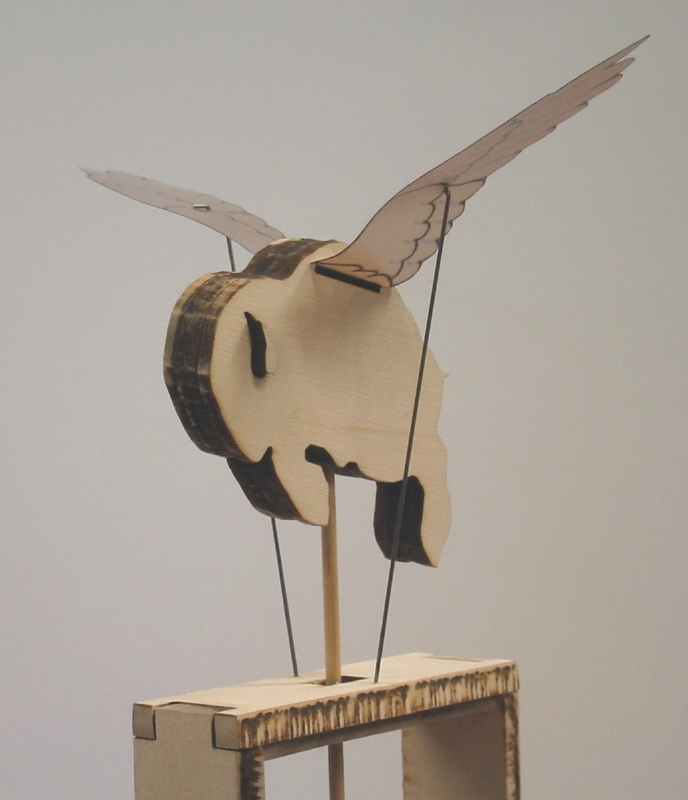 The mechanism uses an eccentric cam with a ring follower to produce the oval motion of the body while the wires in the middle of the wings provide a fulcrum, allowing the wings to act as levers of the first order. With the exception of the overhead transparency wings (printed on a color inkjet printer), wing support wires, and dowels, all of the parts were cut from basswood on the laser cutter. 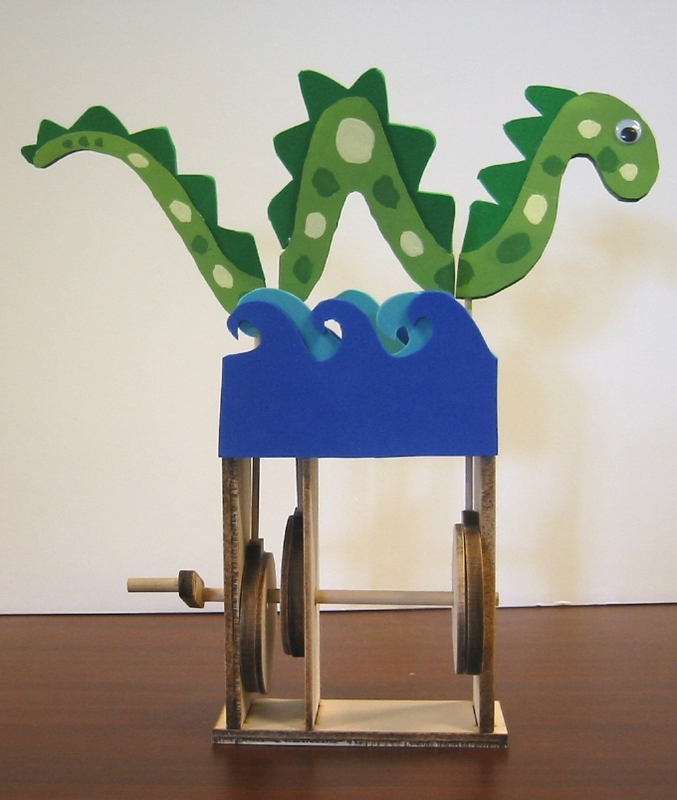 Nessie represents a first attempt to look at mechanisms using more than one motion component (such as the single eccentric cam in Ralphie). By using three eccentric cams with ring followers and rotating each about 120 degrees from the preceding cam, a sinuous, undulating motion is achieved. 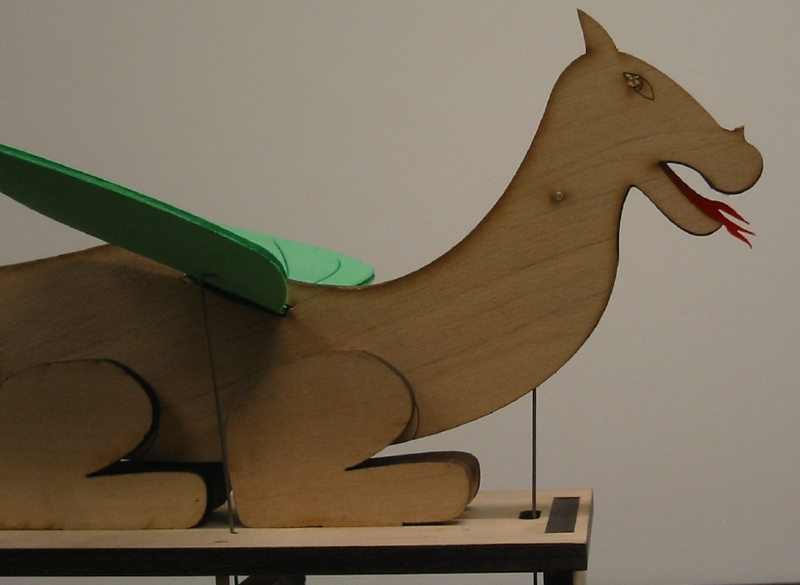 And because the cams with followers impart an oval motion to the tips of the follower where the body segments are attached, Nessie moves from side to side as well as up and down. 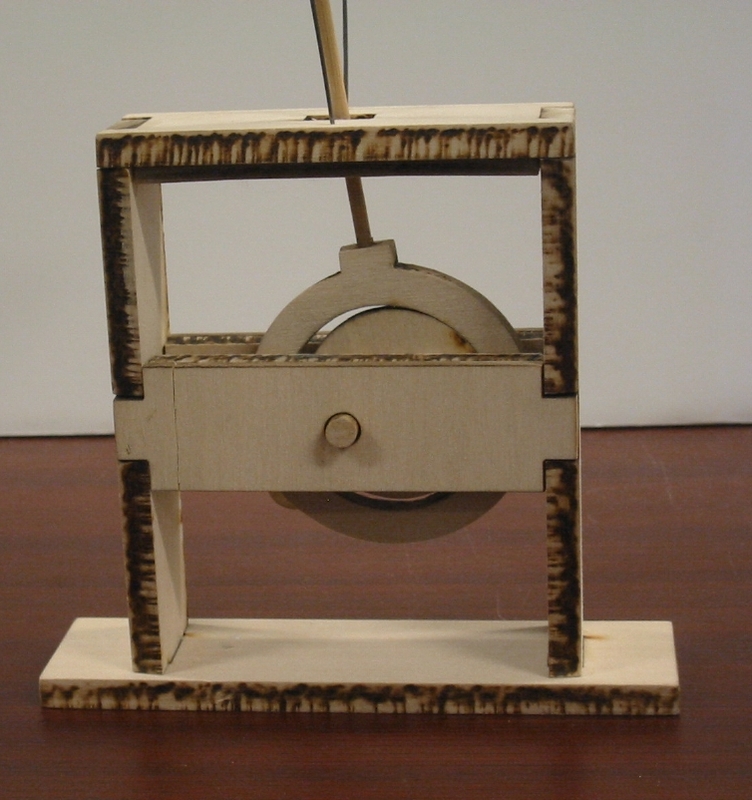 The framework and mechanism were laser cut from basswood and wooden dowels were used for the shaft, handle, and the follower rods. The body segments are cut from 1/4 inch foam core board (as used for posters) and is painted with craft type acrylic paints. 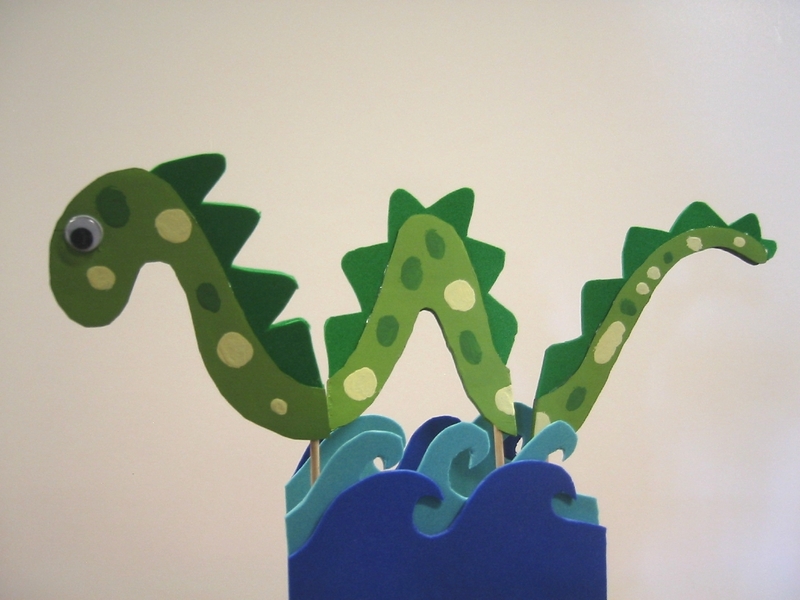 The spinal ridges and the waves are cut from craft foam. Both foam core board and craft foam are readily cut by the laser. 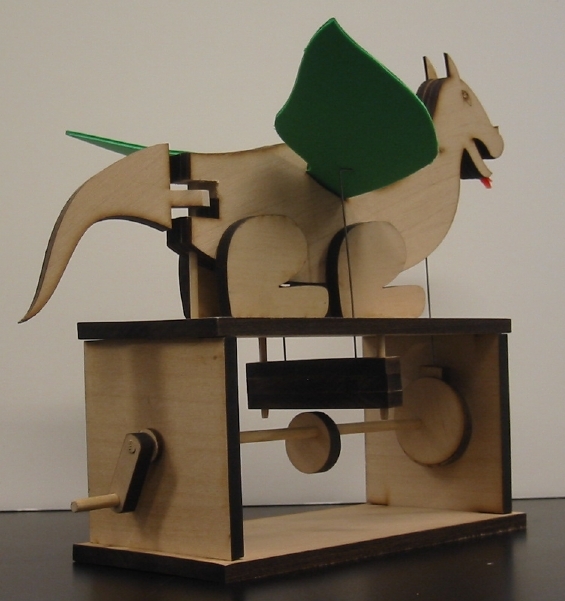 Celia started as a thought exercise to take the mechanism in an available (at that time) wooden kit and use it for a very different automata. Starting with Peter Markey's Angry Cat this quintessential circus performer was created by simply swapping the cat and sea lion head for tail. The cat's spinning tail is now the ball spinning on Celia's nose. The cat's arching back is now Celia's moving front flippers. And the cat's wagging tongue has become Celia's rear flippers. 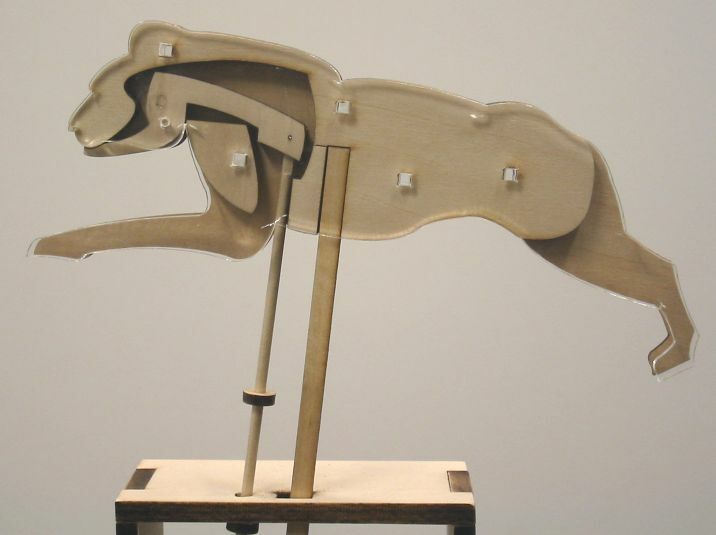 With the exception of wooden dowels, the framework, mechanism, sea lion body, and performance platform are all laser cut from basswood and craft foam. The wooden ball was purchased from a craft store. Celia is painted with a mix of acrylic and spray can paints.